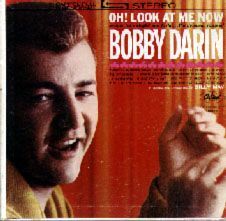 BobbyDarin.net/BobbyDarin.com - "Oh! Look at Me Now"
Entire album available on CD: YES!! Billboard's LP chart for 6 weeks. Oh! Look at Me Now! was Bobby's first LP for Capitol. With classic arrangements by Billy May, the album has many classic Darin tracks such as the title song and "A Nightingale Sang in Berkeley Square."